Angela then when on to develop the unique design and concept for fitbook based on what she saw lacking in other fitness and nutrition tracking tools out there. As it turned out, other people wanted access to what she had created! A business was borne, and she has been helping to change lives ever since. I got to pick her brain about how the fitbook products (esp. fitbook junior) can help impact kids and their families. How do you see fitbook junior benefiting families who are trying to implement nutritional programs for their kids? Angela: What we tried to do through fitbook junior was teach kids how to live a healthy active lifestyle and to set goals. I didn’t want–and I still don’t want–kids focused on calories. I don’t even use the word “exercise” in fitbook junior. It’s called “get moving” or “play” or “go have fun”. The idea is to just track how much you’re moving throughout the day and log your food. The nutrient tracker in fitbook does not utilize calories, rather it focuses on food portions & food groups. Fitbook junior creates learning moments for kids. When they go to their teacher, their coach or their mom and say, “Where do my cheetos go in the nutrient tracker?” It’s not something to judge a child; it’s a great conversation to start. “Well you know, that doesn’t actually fit into any of the food groups. You want to try to eat more of the foods that fall into these food groups where you have boxes to check.” Nutrition tracking is a great chance to educate a child. How have you seen nutrition tracking work with kids? Does it really work? Angela: The reason I wanted to give fitbook junior a try was because the research showed that it worked for adults. The reason it works is because it makes you aware of your behavior. It encourages thinking ahead and planning. You might think twice about eating a donut if you know you have to write it down. There was a Kaiser Permanente study that found adults that wrote down their food over a 6 month period of time lost more than double the amount of weight than those who did not. My hypothesis was that this would also apply to kids. I’ll be honest with you, I think kids are actually better at this than adults. Kids are so innocent in their tracking, where as adults, we get in our own way. We’ve actually seen kids being a positive influence overall on the health of the family. 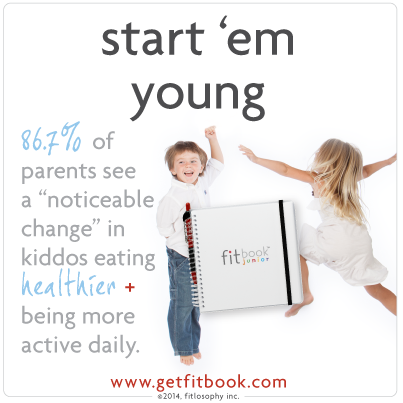 My favorite statistic is that 86% of parents report seeing a “noticeable change” in their child’s awareness of eating healthier, more nutritious foods and being more active daily when they saw them using the [email protected] program (fitbook jr in the schools). It’s very obvious that these kids are soaking in the knowledge as kids do; we just have to make it available to them. What is one of your favorite kid testimonies with the fitbook junior? fitbook junior, the fitness + nutrition tracking tool for kids! To me, that is changing behavior. It is actually teaching kids to not just set a goal, but also work toward something. How might a mom incorporate fitbook™ with a child that cannot read or write yet? Angela: One of my girlfriends used fitbook after she had her babies to get back to her pre-baby weight. Her first baby was really collicky. She used the food log to work with her doctor to figure out which foods were upsetting the baby. Nutrition tracking helped her identify any allergies the baby might have, and she would cut different things out to see how it affected the baby’s health as well. save on both by purchasing a fampack! If you are looking to make diet or fitness changes, you will love this tool! We have alot of teen readers who are looking for ways to lose inches, get healthy, and be more active. They may or may not have the full support of their parents at home yet. What type of guidance and coaching comes with fitbook? Angela: I think you’ve touched on something really important. I’m very clear in fitbook that we are a tool. We don’t tell people what to eat and when or what exercises to do. Every person has different needs. I recommend working with a professional like yourself or a nutritionist and personal trainer. What we know is that if you use the fitbook like it’s intended–which is write things down and plan out your goals–you WILL see results. The research shows that just the act of nutrition tracking will cause you to see results. We do have some free resoures on our site and are coming out with an app that will help educate people more. However, it’s really important that other programs exist like yours to help people with their individual needs. What you do with Proven Nutrition for Kids is so specific to what our goal is. You are doing the work to make the change. We can provide the nutrition tracking tool and education, but unless it’s being implemented with the children, it’s not going to be as effective. [fitlosophy, inc. now has a range of fitbook products, including fitbook junior, fitbook mama2be, fitbook PINK, and other fitness tracking tools and programs.] Click here to visit fitlosophy inc.
Bonnie, thanks so much for letting us know about fitbook. It is so nice to see kids on the right track. I coached a group for over two years, and did see the following things: as per the Kaiser Permanente study, adults that wrote down their food over a 6 month period of time lost more than double the amount of weight than those who did not. Wow, that is a great idea Bonnie. I really liked the point that kids are so much more honest and transparent that us adults. It’s true. That must’ve been a very fun interview for you to do. 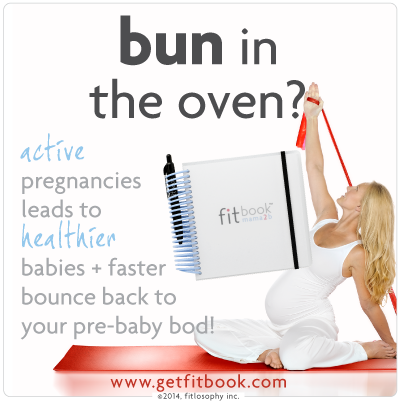 Bonnie, love love love the idea of a fitbook for kids. My youngest grandson would absolutely make a game of this technique. Great article – I have to say I loved the idea of a fitbook for kids – they are such visual learners and it gives me warm fuzzies to know that a new generation is going to learn the importance of eating well, and that what they put into their bodies really does matter. Thanks for the post. Thanks for commenting, Marnie! I hope you’re right, Marnie, because unless something big changes, the health of our kids is not headed in a good direction. A new generation certainly needs to hear how to return to eating well, but we need many more parents to join the bandwagon and help to teach this at home. Next post: 5 Quick & Fruity Frozen Treats For Summer!